Brazen Careerist has an excellent read on how to live with some sense of normalcy during a period of unemployment. It’s one I strongly recommended reading, printing out and passing on to anyone going through a hard time on the job front. One reason I got interested in writing about careers was during a brief period of unemployment – if six months can be considered “brief.” At the time, it was the worst thing that ever happened. The economy was still in a slump and I wasn’t exactly expecting to be on the unemployment line. In retrospect, it was the absolute best thing that ever happened to me (minus the initial shock and financial calamity that followed). Though I’m employed today, losing a job seemed like the end of the world. As I’ve written elsewhere in this blog, so much of our identities can be wrapped up in our careers that losing a job can seem like losing a critical part of who we are. The following tips can help ease the period between jobs. Even if you’ve saved the requisite three to six month months for emergencies, who wants to burn through savings? 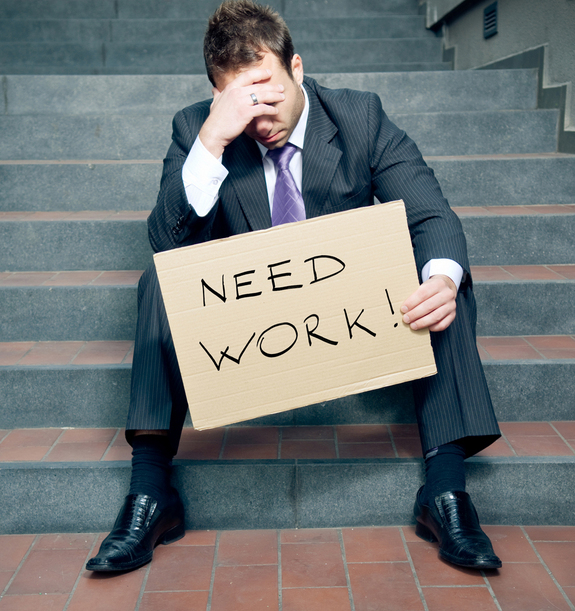 Don’t let pride or embarrassment prevent you for filing for unemployment if you can collect. It’s not a lot of money, but it helps. Collecting unemployment absolutely helped me maintain a sense of sanity – and kept me away from the soup kitchen. Losing a job can bring about all sorts of feelings: anger, shock, sadness, and even brief periods of happiness if you hated where you were. Give yourself a little time to go through these emotions. I had the benefit of being a graduate student when I went through my period of unemployment which put me in a good position to hustle up some internships prior to graduation. Two were paid, the unpaid internship opened the door to my communications career. People hire people they know. Even if you volunteer part-time, it’ll give you an excellent opportunity to meet new people, learn new skills and show off the skills you already have. Volunteering today is an essential key to an open door tomorrow. I understand. Losing a job is embarrassing. However, people can’t help you if they don’t know you need help. Tap your network. Get on LinkedIn. Tell everyone that you’re looking for a new job and ask them to keep you in mind if they hear something. Oh, and it helps to know what you want to do. Theoretically, this should be done periodically while you’re employed. If not, you’ll just have to run a little harder to catch up. Make sure your resume is up to date and reflects your career accomplishments, not just a list of your job duties. If you’re networking in person or online, having an up to date resume is an essential tool to shortening your job search since it’ll be ready the moment someone asks you for it. Losing a job, even under the best of circumstances, is catastrophic. However, using your time productively can ensure a relatively smooth transition from the lost job to the next job – and increase your quality of life. If you settled for the job you previously lost, resolve not to settle again. You’ll feel much better about it later.